I took some time. 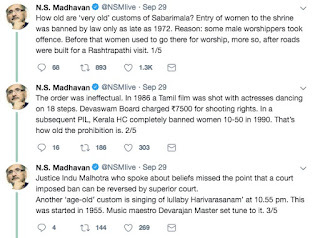 And herewith I log my questions and observations on the recent, highly debated Supreme Court verdict on the entry of women into Sabarimala. I have done some reading basic reading in Anthropology, listened extensively to scholars and doyens and sthapathis on what Aagama Shastras are. I have thankfully, in real life and in my formative years, been in the company of wonderful men and women who have welcomed debate, welcomed questions and answered them with all their wisdom. Here is another article I read which explains 8 different forms of Sastha. "Dharma Sastha disseminates knowledge and peace. He is said to break the barrier of caste and creed and guides us towards righteousness and salvation. Saturn effect? He is believed to provide solace. Sri Dharma Sastha was a Brahmachari. However, in previous avatars, Sastha dwelt at Kantha Mala with two consorts Poorna and Pushkala. A distinct line therefore should be drawn between Sastha and Manikanta." If a distinct line can be drawn between Sastha and Manikanta, then rules denying entry do not make sense to me. 2. Sabarimala, named after Sabari, I suppose, is where she offered fruits to Rama after tasting them. After partaking the fruits, Rama sees a young Tapasvi and asks who he is. Sabari says he is Lord Dharmashasta. As Rama walks up to him to pay his respects, Lord Dharmashasta gets up, breaking his penance to greet Lord Rama. This day is celebrated as Makaravilakku day. The day Dharmasastha stops his Tapasya to bless his devotees. When Lord Sashta has Himself taken a break from his penance, how can a fertile woman disturb his penance? 3. Tat Tvam Asi - Thou Art That - "Is the principle philosophy that governs the temple (Sabarimala) and pilgrimage. As the pilgrimage is symbolic for the journey to self-realization that all living beings possess the essence of Brahman, pilgrims refer to each other as Swami, acknowledging their divinity"
If this is the case, if the pilgrimage is symbolic to understand all living beings possess God in them, how are women not a part of that group of living beings? 4. 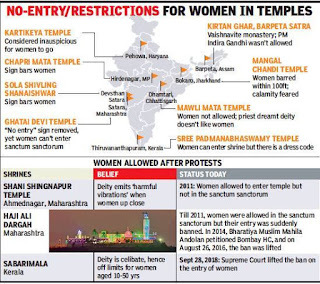 When Lord Ayyappa gave the Pandala Maharaja the instruction to build them temple at a certain location, I doubt he would said "Build my temple, but stop the fertile women from entering my shrine because they will disturb my penance". However, if you were to believe he is Sastha, or teacher, he is automatically wiser than normal human failings. Which is why I have issues believing a punishing, angry God but this is another debate/post for another day. 5. Is there anything more powerful than prayer and faith? My faith tells me that God resides in me. If Lord Ayyappa were disturbed by fertile women, technically women should have been barred from even praying or thinking of Him, No? 1. It was not as if girls in olden times were looked upon as children much. They were groomed for marriage from the time they are learnt to speak, taught to be responsible as children and many such children, if they attained menarche by 11 or so and have their own children. Which perhaps explained the number of deaths during childbirth. Girls were married off by 6 or 7 to boys in their teens or even to wayyyy older men. Ramakrishna Paramahamsa married the 5 year old Saradamani Mukhopadhyay when he was 23 years old just 180 years ago. Of course, such brides would be sent to their husband's home only when they attained maturity. But it is not as if girls weren't married off by the time they were 10. 3. "Kerala has women only festivals where men are not allowed." 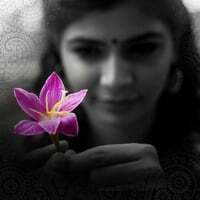 Kerala is a matrilineal society; something that women can only dream of elsewhere. Yes. Kerala also has the unifying Onam for all people belonging to the soil of Kerala. IMHO every region in India has had a way of going about ritualistic practices. Ambubachi festival of Kamakhya temple, where the Goddess is supposed to be menstruating and people fall over each other to get a piece of the red cloth will see a lot of people sacrificing cattle in the premises of the temple. Animal sacrifice in the precincts of the temple would be unacceptable in Mylapore Kapaleeswarar Temple. I have seen Poojas in Kamakhya temple, wherein the priest partakes some alcohol, performs a Pooja, partakes alcohol and this cycle continues for about 30-45 minutes. I don't understand Assamese, I had no idea what was going on but the priest drank hard liquor within the sanctum sanctorum during the ritual. Temples were perhaps the original areas of congregation and community building. Every temple constructed then had huge halls, mandaps, where music and dance performances happened. Prospective brides and grooms were spotted in Temples, Alliances forged, major political decisions were also taken in Temples, after advice and ritualistic practices by chief priests, advisors and the King. Devadasis of yore, the Rudraganika or the Chief Dasi had a part to play in such matters. What exactly, I am unaware. I need to read. Festivals associated to temples was perhaps have been a community exercise, if I can hazard a guess, to bring people together, to give them a reason to celebrate, for small businesses and vendors to thrive and this was perhaps the only 'tourism' activity of those days; people traveling from villages and towns to the 'city' where the main temple was. At some point, religion and politics got married and places of worship became seats of power as well. 4. I think rules with regard to Men ONLY or Women ONLY followed a need of that time and with Hinduism being dynamic as it is, change has always happened, through time. It is only natural for us to embrace it. 5. The Thiruvanaikkaaval Temple has a midday ritual where the priest wears a Sari and does the Pooja. The belief is the priest becomes Parvati for that ritual alone. 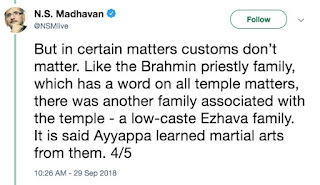 I wondered, when I saw the priest walk into the sanctum sanctorum in a sari, if at some point in history, a woman would have done that particular Pooja and if men found ways of elbowing women out of Temple duties. 6. "Trekking to Sabarimala is arduous and hence they asked Women to keep away" - It is equally arduous for men. If faith can move mountains for men, won't it do the same for women too? I read Sri Maalan Narayanan's post on Facebook where he quotes the advisor of the erstwhile PM, Manmohan Singh, PKA Nair, who said his "Chorunnu" ceremony, when the first morsel of solid food after weaning from milk is introduced to a baby, took place on his mother's lap at Sabarimala. 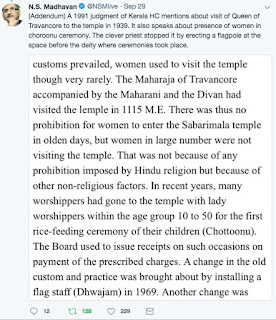 This signifies that 'fertile' women did visit Sabarimala. 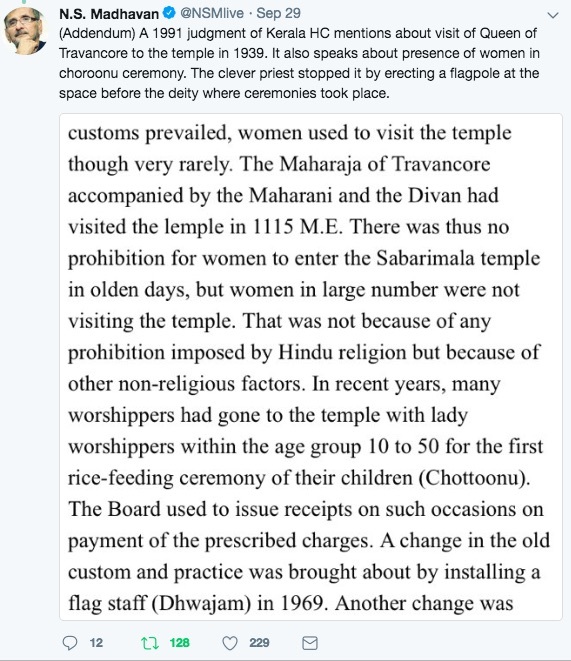 Around the 1950-s, a fire broke out in Sabarimala and there were rumours that it is because of women that the sanctity of the temple got ruined. Women stopped themselves from going and it became an unspoken "rule". The actual court order came only in 1991. 7. "A menstruating woman would attract wild animals" - A lot of men routinely scratch or cut themselves on the path and enough men have bled along the way. 8. "Why go someplace where you are not wanted? "; "Why do something which is not liked by others?" - This is exactly what perpetuates status quo that plays to the whims and fancies of the socially powerful. 9. "Your going to the temple is against Aiteeham; it is against my belief system. It harms no one for you to respect my beliefs. Don't go the temple" - The word Aiteeham stems from Itihasa, or historical. History has been witness to a humanizing and dehumanizing practices. Change wrought about, not by request but by struggle. It was the belief system of people to spit on oppressed castes if they set sight on them. It was the belief system of people to ask oppressed castes to wear a broom around their neck while the walked the streets so that the broom swept over the path they walked in. It was the belief system to keep oppressed castes outside of the village. Lower caste women in Kerala weren't allowed to cover their breasts and this changed only when someone started defying. It is *still* the belief system of people to deny oppressed castes from using water from wells in so called upper caste areas. It was the belief system of my mother-in-law's grandmother to bathe if she set sight on a menstruating woman. Some of this social practices based on "belief systems" have changed. Some haven't. When someone's belief system denies someone else the right to equality or dehumanises them in some manner, those belief systems can rightfully find a way out of human consciousness. 10. "The deity is undergoing Penance. Hence must not be disturbed by Fertile women" - Vaishnodevi sits in penance in the Trikuta hills in Jammu, waiting to marry Lord Vishnu at the end of Kaliyuga. The trek of 16 kilometers is extremely arduous. I was fortunate to have visited the temple when I was 16-ish. Thankfully no one told the men or the women that the Devi doesn't want to be disturbed while she is meditating in the Trikuta hills. As far as I am concerned, God did not create people unequally. People with power prevented the entry and participation of some segments of society to give themselves more power. That's all I think there is. Lord Hanuman is said to have noticed Sita for the first time in Asoka Vana when she was performing the Sandhya Vandanam. This means women were invested with the sacred thread; Sita being a woman of the ruling class and not of the priestly class, was invested with the sacred thread. Somewhere along the way, things changed, the sacred thread became the bastion of some. Someone changed tradition and that became new "tradition"; to deny "education" that came along with the investment of the sacred thread from a Guru. The powerful became more powerful, sections of human beings were made to become weak, weaker. Time and again have stories associated with temples told us about how the Gods have punished the priestly class for disallowing oppressed classes into the Temple. From the story of Vitthala bearing a swollen cheek, because his devotee, Chokha an untouchable was slapped by a priest or the Kanakana Kindi (Kanakadasa's Window) in Udipi where Krishna made sure his devotee Kanakadasa could have a darshan of Him as and when he wanted, there are multiple such examples. But nothing much changed in the Temples being open for all. 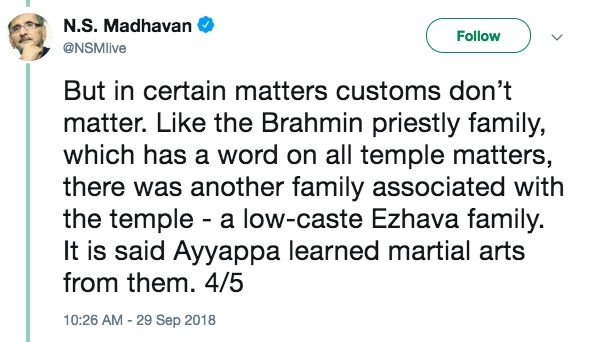 Quoting Wikipedia from the Chokha Mela page, "In early 20th century, the Dalit leader B. R. Ambedkar attempted to visit the temple, but was stopped at the burial site of Chokhamela and denied entry beyond that point for being a Mahar." The irony in this report makes me choke. My Faith tells me that God is everywhere. In elders telling me that there is a Sthala Purana and a Sthala Vruksha, a Vahana for the Gods that we revere, I learned that my faith teaches me to revere every living being. From the mighty Banyan tree, the beautiful peacock, the crow, the snake, the rooster, to the humble mouse, that gets all the Poojas and offerings to Lord Ganesha. To putting Kolam outside our homes with rice flour which teaches us that we start our day with feeding the smallest of the beings - the ants and other insects that can eat the rice flour. My faith tells me that Hari is in a Pillar and in a speck of dust. As our souls evolve, my faith teaches me to move beyond ritualistic practices, idol worship and find the path to enlightenment; to find release from the cycle of birth and death. Music being one of the paths to reach the Supreme being, I am proud to be born in this land, to have exposure to the musical and art forms, to plurality and to intellect. This land has historically celebrated intellect and encouraged debate. 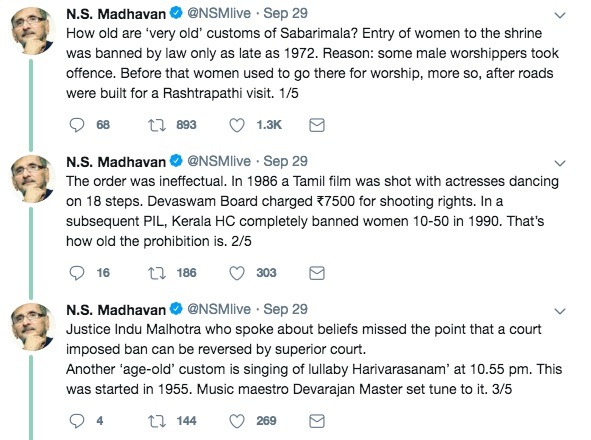 To me there can't be better example of Divine Will than of M S Subbulakshmi ma's voice ringing out at Tirumala at dawn or Sri K J Yesudas' voice putting Lord Ayyappa to sleep. P.S. : "Why don't you comment on Mosques and Islamic shrines barring entry to women?" - It is not my place to comment because I am not a practicing Muslim. There are various sects and belief systems within the Faith that I do not have knowledge of. It is not my place to tell someone else how to feel. It is up to the women and men of any belief system - religious, political, social or legal - to bring about change to empower all members in their community. Women in Saudi have recently fought their right to drive a car. What seems like baby steps to some is a giant leap for others. Temples where women are not allowed, some of them are strangely, temples of Goddesses.